Last Saturday it was really cool and rainy. Dennis and Larry took a drive to the tiny, tiny town of Loon Lake and bought ice cream at the cutest log cabin ice cream parlor. 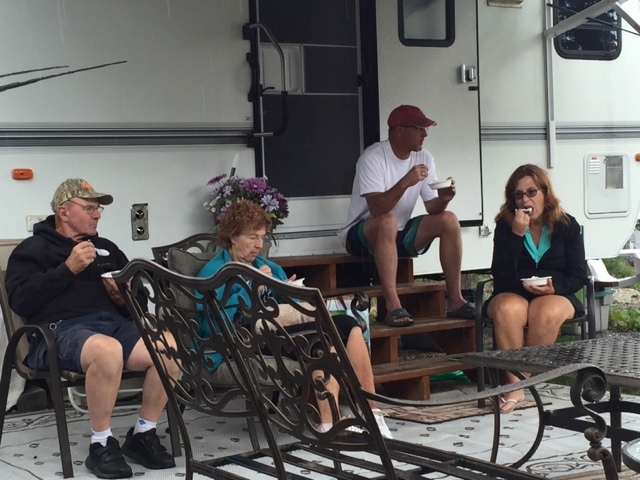 Two quarts of Huckleberry Cheesecake and Moosetrack ice cream were brought back and we all sat around under the awnings of the two trailers and ate ice cream in the rain. Don't let Paul's swim trucks fool you. It was cold and he went and put sweat pants and a coat on right after I took this picture. Notice the cushions are off the loveseat because it was raining. Mandy told me about this book she bought last week and I found one on Amazon for $2.00! Really! Just $2.00. It has over 850 pages and is a how-to guide to keep a home. 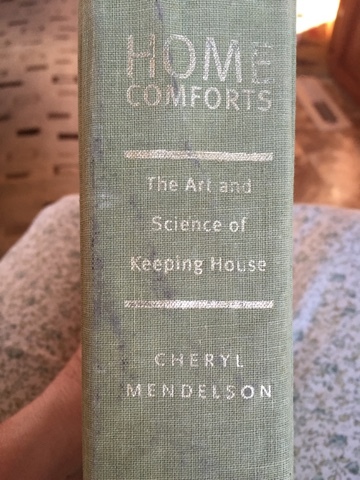 Not a cookbook, not a cleaning book, but an actual manual for keeping a house properly. How to choose linens, mattresses, etc. I've only read about 20 pages and I think it's a great book. 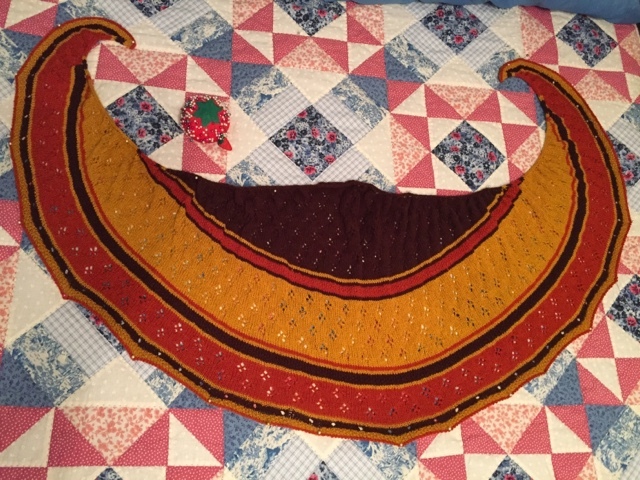 I finished the Christmas gift shawl. Sorry about this picture. I have it blocking on the guest room bed and the colors clash A LOT. This thing is huge and stretches across an entire queen size bed. I love it. A close look at the lacework. I really want to make myself one of these maybe in silver, purple and I don't know what to choose for the third color. 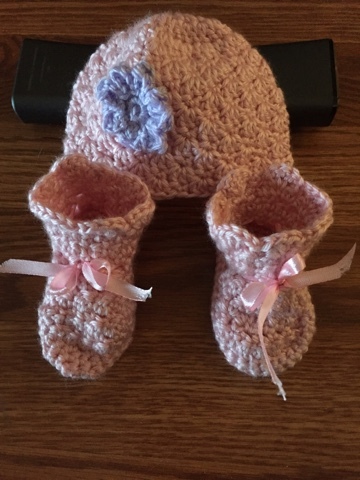 Teresa (over on my sidebar), recently rewrote her baby hat and bootie patterns. I made one bootie last night and the other one and the hat in just an hour or two tonight. Aren't they cute? The color isn't great because I just took the photo and it's completely dark outside. A better picture that shows the color more accurately. This was the first one I made yesterday. If you crochet and like to make baby things, I highly recommend Teresa's patterns. She has generously provided them on her blog for free for us all to use. 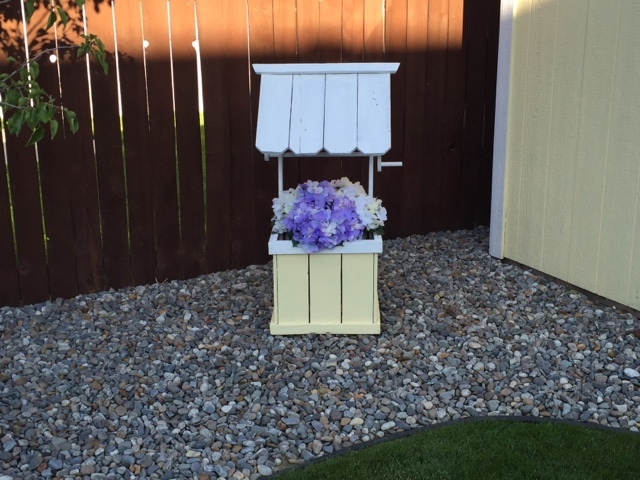 Our neighbor had this little wishing well by the side of their house for a couple of years now. It was on it's side and in really bad shape. We asked them if they wanted to get rid of it and they couldn't say yes fast enough. They didn't want to pay to take it to the dump. Dennis carried it home for me and sweet man that he is, spent hours sanding and repairing every board before painting it to match the shed and the house. He put it in the backyard for me tonight. Isn't it sweet? I love it. 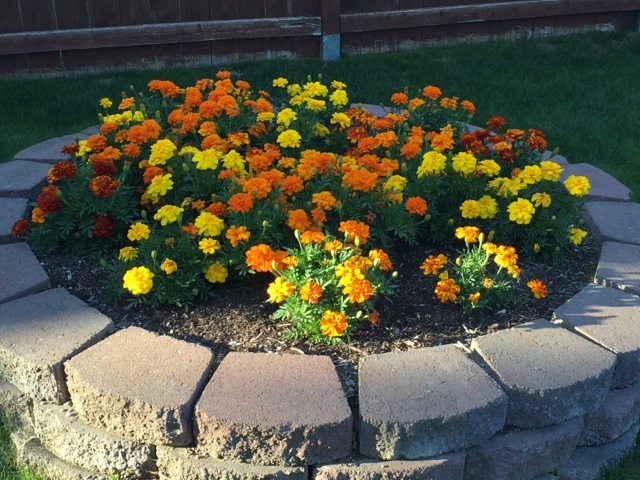 The marigolds that I planted in the bed that something ate all the green bean plants in this spring are flourishing. Whatever ate the green beans aren't a bit interested in the marigolds, thank goodness. These are the flowers I was buying when I hit my head and gave myself a concussion. It's a good thing they're doing well after all of that don't you think? Ha! 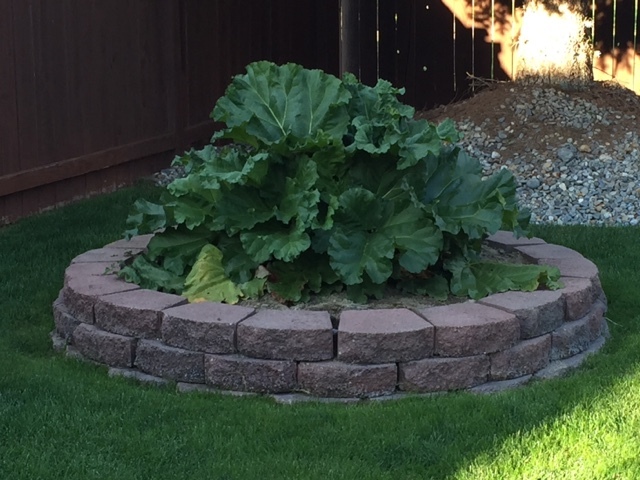 The rhubarb is still producing too and it isn't woody or fibrous at all. Probably because of the nice cool spring and summer we've had so far. The big news here is we bought a new bed last week. Ours is at least 17 years old, probably older but we can't remember exactly when we bought it. The new one is a sleep number bed and is supposed to be delivered on Saturday. We need a new one desperately as there is definitely a dip in the middle of our bed that we both end up rolling into during the night! It's gotten quite uncomfortable to sleep in and we often wake up with backaches. We joke that the cheap mattress in the camper is much more comfortable than the nice one we have at home so hopefully the new one will be better. I ended up in the ER on Monday morning and after many tests have an appointment at the cardiologists tomorrow. Next Thursday I have to do yet another nuclear stress test. No idea what's happening yet, but I do know they are planning to lower the threshold for recording the tachycardia events on my pacemaker so they can get a more accurate reading. Just have to say, I'm VERY tired of all of this. I just want to go to the lake and be comfortable and able to walk and play in the water like I used to. I know compared to many, I have absolutely nothing to complain about so please excuse my whining. I hope you're all enjoying your summer and having picnics and special times with family and friends. The world is becoming an increasingly scary place and our homes are our havens of peace. At least mine is. I'm finding myself not wanting to leave and go into the world much these days. But, I remind myself that we can't let this horribleness win. I'm avoiding the news as much as possible these days and surround myself with music, books and yarn. Some of my favorite things. I hope you have things that bring you comfort in these days of uncertainty too. I'll talk to you all again soon. Happy summer! I do so hope that your medical issues are sorted very soon, know that you are in my prayers. I love the shawl, what a stunning gift and the colour combination is right up my street, perfect. Take care. Hope you enjoy your Sleep Number bed as much as my hub and I do. We're on our second one--it does take awhile to get used to it, tho. Experiment with the different levels until you find what works best for you. Thanks for Joshua 1:9--sounds like you're going thru some health issues (so am I) and nothing brings me more hope and peace than God's promises. Be well!! Look at everyone wearing sweatshirts! It's so hot here I can't stand it. Love the shawl and the booties. I have an old timey housewife book too that I LOVE. I am old enough to remember some of the old practices. It's a great read. Makes you really appreciate what we have now but I do miss the simplicity of the time. I'm like you. I hate to go out anymore. A day without the car is a blessing. Hello Betsey sorry to hear that health issues are still such a big part of your life - I hope that things soon improve for you. The shawl is beautiful and I love the baby hat and booties - so sweet. Love rhubarb - very partial to rhubarb crumble :-) my marigolds seem to be doing well - my brother gave them to me along with beans, tomato plants. cucmber plant and various other flowers. I want ice cream. Hugs to your ticker. They'll figure it out. Have fun at the lake. Dear, sweet Betsy! I am so sorry to hear of your health issues and ER visit. I am praying for you right now. I hope you are soon able to do the things you so long to do. Sending you love and hugs. I do hope that you will visit my blog . . . and maybe you'll like it enough to follow me back. I started blogging about 5 years ago and it has open up so many creative ideas and opportunities to travel the world through sister blogs. Glad you are ok, but a bummer to end up in ER again. Prayers for answers. Your shawl is nice in color even on the different background. How would off white or white go with purple and silver? or a lighter shade of purple? We just got back last evening from our trip to Newport. I blogged about while being lazy in bed this a.m. My video is from my phone. I did take other videos on my camera but not got them on the computer yet. I made a few people happier this weekend, especially a young black man I saw while on the bay front. He perked up when I said hello and was listening to me talk to a man about his drawings on rock. Sweet! We stopped for ice cream waffle cones on our way home, which is a tradition for us! Feel better soon my dear friend! Hi Sweet Betsy, Sorry to read about your latest problems with your heart... I know you are TIRED of going through this... Prayers for you. Congrats on the new bed... Ours is over 10 years old --and we need to think about making a change sometime. As of now, it's still pretty comfy.... Let me know how you like the Sleep Number Bed after using it awhile. 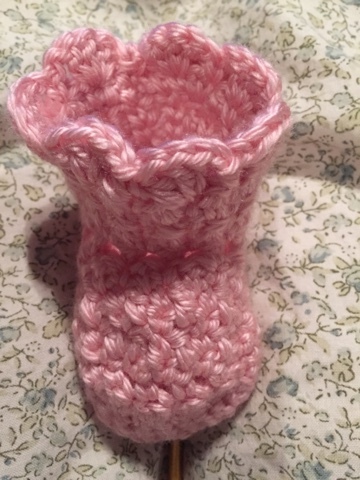 Your baby booties and hat are adorable --and I love the little wishing well. The booties and hat are so cute! 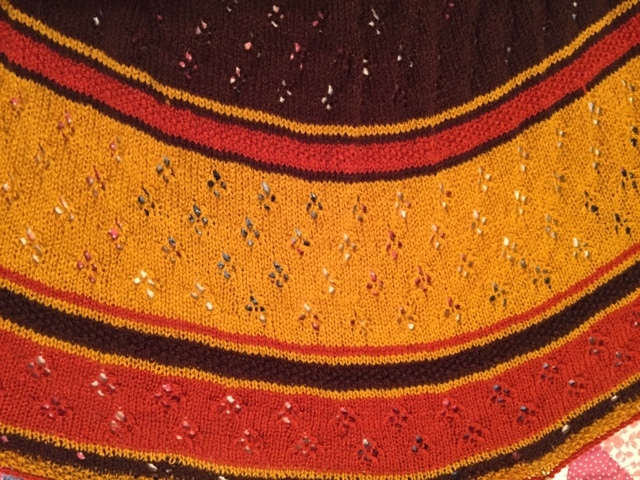 The shawl is too, and it looks very fall-ish. I hope your tests turn out ok and all is well- I will add you to my prayer list. I'm waiting for cooler weather to plan outings, but as they say..don't waste time waiting, so I think I am going to just brave it and go on and do what I want..broken leg and all.